Being a student is an exciting time of exploration: new ideas, new freedoms, new friends, perhaps even a new city. Whether you’re looking to deepen you faith through rich Bible teaching and fellowship, or exploring Jesus’ claims for the first time, there is something for you at Barneys. Barneys church services are located close to Sydney University, UTS, Notre Dame, and other tertiary institutions. If you’re studying and looking for a church then come by and see if Barneys is for you. Most of our students and young workers go to the Sunday night church service at 6:30pm. Many of our international students choose to come to the Sunday morning church service at 10am or to Barneys Overseas Chinese Church at 4:30pm. 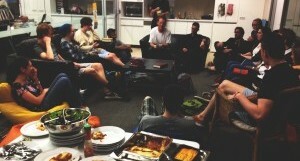 Our young adults meet together in small groups throughout the week. Often they’ll share a meal together, meeting either at someone’s house or at the church. If you’re living in accommodation in or around Sydney Uni, Notre Dame or UTS we can help connect you with Christian groups that meet together where you live. We have active groups at all the Sydney University colleges, plus many of the other student residences around the university. Email Rhys Duggan, or call 02 9211 3496. Barneys partners with student leaders to enable a ministry to South East Asian students. ICF meets on Friday nights at Barneys for worship and Bible Study. For more information email Erica Hamence, or reach out to ICF directly: you can email Jarrod (president) or call 0424 935 218, or reach Vanessa (secretary) at 0423 716 577. Many of our Chinese international students are involved in English and/or Mandarin Bible Study groups. These groups meet at Barneys and on campus at UTS and the University of Sydney. For more information email Jason Cheng or call 02 9211 3496. Lots of people are moving closer to uni into colleges, one of the many university residences, or share houses. We want to help connect you with other Christians who might already be meeting together where you live. The St Barnabas Terraces are six houses on Glebe Point Road offering secure, inexpensive, self catered accommodation for male and female undegraduate students 18-21 years old, who can stay for the whole academic year. 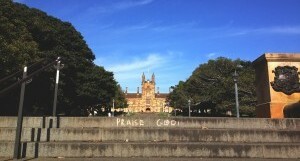 Only five minutes from Sydney University or a short bus trip to UTS. Close to Central Railway Station. A great location, a great environment … with plenty of opportunity to make great friends.